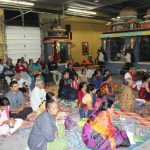 The second day of the Madura Utsav at the DFW Hindu Temple commenced with Bhagavatam Parayanam and continued with Dhamodhara Leela on Friday, November 23rd 2012. Shri Ramanujamji started with extolling Dhamodhara as the one who could be bound by the thread of love and devotion. The emphasis was on two different mothers who attained the same place through the immense grace of Lord Krishna, who were so different by nature. One was Puthana who pretended to be loving but tried to poison Krishna, while Yasodha ma even though appeared very strict was very loving to Lord Krishna. Shri Ramanujamji’s description of the story with anecdotes from various scriptures and by Mahans added more glory. 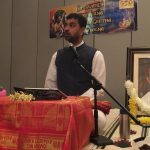 He then went on to describe the divine plays on the deliverance of Thrinavartha and Sakatasura. Shri Ramanujamji then explained beautifully how butter could be separated from buttermilk but Lord Krishna could not be separated from butter. 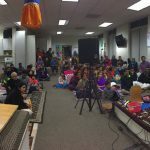 He then went on to vividly describing the great Chithachora episode with immense Bhava that was enjoyed by one and all, young and old alike! The devotees could relate themselves with Yasodha ma when Shri Ramanujamji explained in detail the way the lord showed the entire universe to his mother by opening his mouth, indicating that the entire creation is in him. Sri Ramanujamji drove home the precept of Damodhara leela, that even though Yasodha ma tried to bind him with all the rope in the world, she was able to bind him only through surrender and love. 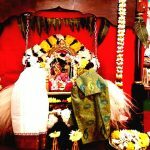 The sons of Kubera (Nalakubera, Manikreva) attained mukthi through this divine play of the lord. The Satsang concluded with Divyanamam of Damodhara, performed by the ladies followed by Dolostavam. 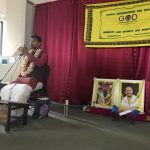 The devotees’ heart and soul remained in Gokulam and were eager to hear more about Him, and were looking forward to travel to Brindavan for the Govardhana Leela the next day!